Are you searching for a way to tap into new customers? What exactly is Social Media Marketing and how can your business benefit from it? Wikipedia defines social media marketing as the process of gaining website traffic or attention through social media sites. It sounds so simple… However, the vast majority of businesses never even scratch the surface of the true potential and immense power that Social Media Marketing has to offer. This couldn’t be the furthest thing from the truth. It gives you a vehicle to build rapport and further enhance relationships with your clients/customers. It provides a platform for your clients/customers to say good things about you and to tell their friends about your business. And on top of all of that, Social Media Marketing is the ULTIMATE tool for Brand Building and Reputation Management. Is Social Media Marketing worth the effort to promote your business? 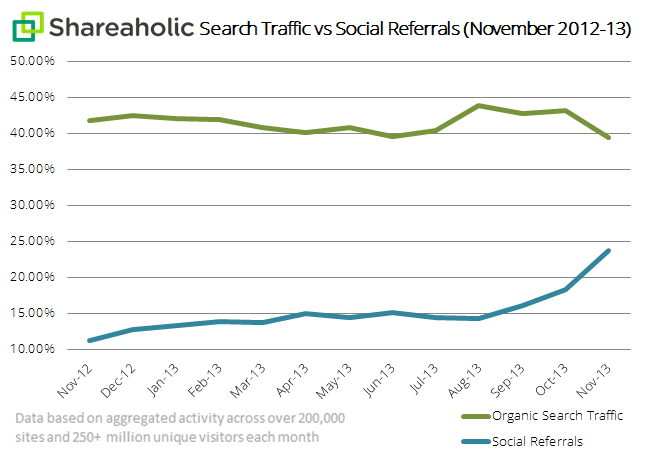 A study conducted by Shareaholic.com reveals that referrals from the top 5 social media platforms more than doubled from November 2012 to November 2013 growing 111%, while search traffic dropped by 6%. It means that people are changing the way they find the things they are looking for on the internet. The development of Facebook advertising, sponsored stories and newsfeed marketing. Optimize Facebook page layout to encourage consumer interaction. Google+ page creation and design. LinkedIn business page creation and optimisation. Youtube page creation, design and development. Social media monitoring and analytic reporting. But before any serious advancements are made in Social Media Marketing, you must begin with a comprehensive social media strategy. Join Me For A Free 1 Hour Strategy Consultation. Complete the form below to get started.